Home Insurance Top 5 Reasons LIC Insurance Claim Can Be Rejected? LIC Insurance is a protection tool provided to safe guard our family when we are not around them. Financial protection is essential for our family as this makes their needs and wants fulfilled. LIC offers various insurance schemes that can make our and our family future secure. In case of the claiming of the LIC policy, may it be the death claim or the maturity claim it is important to know how to claim the LIC Policy. Even though LIC is known for the best Claim settlement ratio which makes it one of the most trusted insurance company but still there is a space for the rejection of the claims therefore, we have collected top 5 reasons why LIC insurance Claim Can be rejected? The most common factor of rejection of the LIC policy claim is the undisclosed facts about the insurance claim. When we apply for the insurance claim the insurance company cross-checks the claim by reviewing the facts and documents attached to the claim application. It is also important to present the insurance company with the right information like age, profession, medical condition (if any), etc. any miss-information or forged document can result in the rejection of the Policy Claim. If the Premium payments are not paid in time then the policy gets into the grace period after which your policy will become Lapsed meaning continuous non-payment of the premium will make the policy lapsed and no insurance benefit will be available after the lapsed policy. A Medical test is used to determine whether you are perfectly fine or have any health condition. Before availing the LIC insurance you have to provide the medical details which will be further verified using a medical test. There are chances of rejection when the medical test is not performed before insurance as the insurance claim can be rejected for having a pre-existing condition. Having a medical exam will also reduce the chance of rejection during claim as the medical tests have already been performed. Nominees are those individuals from the family who are entitled to receive the claim amount in case of the death of the insurer. If the insurer does not mention any nominee detail then you cannot claim the insurance which will result in the Rejection of the Insurance Claim. When availing the policy, it is clearly mentioned with the condition and term under which the policy can be rejected. These conditions can be suicide, drug overdose, death by accident under intoxication, etc. 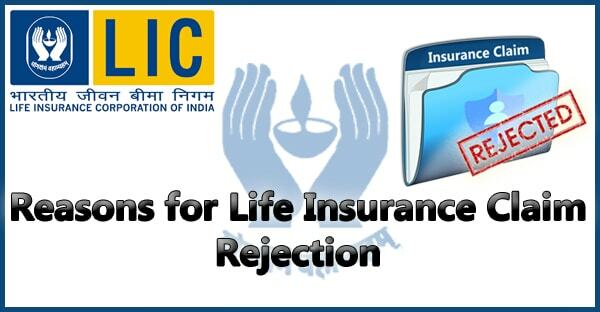 which may result in the rejection of the LIC insurance Claim.